Halifax Stanfield International Airport (IATA: YHZ, ICAO: CYHZ) is a Canadian airport in Goffs, a rural community of the Halifax Regional Municipality in Halifax County, Nova Scotia. 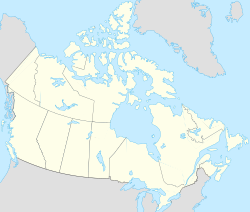 It serves Halifax, mainland Nova Scotia and adjacent areas in the neighbouring Maritime provinces. The airport is named in honour of Robert Stanfield, the 17th Premier of Nova Scotia and leader of the federal Progressive Conservative Party of Canada. The airport, owned by Transport Canada since it was constructed, has been operated since 2000 by the Halifax International Airport Authority (HIAA). It forms part of the National Airports System. Halifax Stanfield is the 8th busiest airport in Canada by passenger traffic. It handled a total of 4,316,079 passengers in 2018 and 84,045 aircraft movements in 2017. It is a hub for Air Canada Express, Cougar Helicopters, Maritime Air Charter, PAL Airlines and SkyLink Express. An airfield in the West End, known as Chebucto Field, was built as the Halifax Civic Airport by the City of Halifax in 1931. It served as the city's main airport until 1942, when it was closed and converted to an army base. Today Saunders Park, named after the first Halifax airport manager, marks the site. RCAF Station Shearwater subsequently functioned as Halifax's primary airport until the current airport was opened. In October 1945, the City of Halifax asked the federal Department of Transport for help choosing a site for a new civil airport. A key factor was to find a site near Halifax with a minimal number of days per year when fog would affect airport operation. Lucasville was favoured, but after a year of study it was found to have similar average visibility to the frequently foggy airport at Shearwater. A site near Kelly Lake was then scrutinized based on a recommendation by Trans-Canada Air Lines. After two years of monitoring, the site was officially approved in 1954 for construction of a modern, C$5 million airport. The land was purchased by the City of Halifax on April 5, 1955, while the federal Department of Transport was tasked with building the airport. Construction of the new airport began in November 1955. The runways were built by Diamond Construction of Halifax. The modernist terminal building was designed by Gilleland and Strutt, an architecture firm which previously designed a similar-looking terminal at Ottawa. The new airport was substantially completed in June 1960. An opening gala was held on Dominion Day of 1960. At 4:50 am on August 1, 1960 the first airplane landed there, a Vickers Viscount running the Trans-Canada Airlines Flight 400 between Montreal and Newfoundland. It was piloted by Halifax native W.E. Barnes. The first overseas flight arrived an hour later, travelling from London en route to Montreal. The airport was formally inaugurated on September 10, 1960 by the Minister of Transport, George Hees. The ultimate cost of construction was about $18 million. Passenger numbers grew steadily during the first few decades of operation. The passenger terminal was substantially renovated in 1966. A 5,000-square-metre (54,000 sq ft) passenger terminal extension opened in July 1976. By 1990, approximately 2,500,000 passengers passed through the airport annually, up from about 180,000 when it first opened. A 400-square-metre (4,300 sq ft) southern expansion was opened in December 1994 by Minister of Transport Doug Young, while the check-in area was expanded in 1998. Owing to the National Airports Policy, announced in 1994, the Halifax International Airport Authority (HIAA) was founded in November 1995. Management of the airport was officially passed from Transport Canada to HIAA on February 1, 2000. Following the September 11 attacks the airport took part in Operation Yellow Ribbon, commenced to accept United States civilian flights after the Federal Aviation Administration closed down U.S. airspace. Halifax airport took in 47 flights—more flights than any other Canadian airport involved in the operation—carrying about 7,300 passengers—more passengers than any other Canadian airport involved in the operation other than Vancouver, which registered 8,500. Much of this was because flights that were coming from Europe were told to avoid the major airports in Central Canada, like Toronto Pearson, Montréal-Dorval, and Ottawa Macdonald–Cartier International Airport. Shortly after the attacks, the airport was advised that as many as 40 to 50 planes would divert to Halifax. In response, runway 15/33 (now 14/32) was shut down to accommodate the parked aircraft. The first diverted aircraft, a United Airlines Boeing 767, arrived at 11:35 am. The number of arriving passengers greatly outstripped the capacity of the airport, which faced processing 7,000–8,000 people with an arrivals facility designed to handle 900 per hour. The Halifax municipal government was tasked with providing emergency shelter, food, transportation and care to the stranded travellers, who were housed in city sports complexes and schools, churches, universities, military bases, as well as the homes of private citizens. A memorial ceremony was held in the airport terminal on September 14, 2001. To honour the people of Gander and Halifax for their support during the operation, Lufthansa named a new Airbus A340-300 Gander-Halifax on May 16, 2002. That airplane is listed with the registration D-AIFC, and is the first aircraft of the whole fleet with a city name outside of Germany. On September 11, 2006, five years after the attacks, United States Secretary of State Condoleezza Rice visited Halifax airport and delivered a speech of thanks. After the December 2003 death of Robert Stanfield, the former Premier of Nova Scotia and federal Leader of the Official Opposition, several proposals were made in Nova Scotia to honour the widely respected politician. In early 2005 the airport's governing board voted to rename the terminal building after Stanfield. The terminal was officially rechristened in a ceremony held on September 9, 2005, when the Stanfield family unveiled a brass memorial plaque in the airport observation floor. On Friday February 9, 2007 Prime Minister Stephen Harper arrived at the airport and formally renamed the entire facility from "Halifax International Airport" to "Halifax Robert L. Stanfield International Airport" in a further honour to Stanfield; at that time the terminal name was dropped and reverted to its original status. Halifax International Airport fared well in the 2005 AETRA survey for passenger satisfaction, produced by the International Air Transport Association (IATA) and Airports Council International. The airport was ranked the best airport in the Americas for the second year in a row, as well as the best airport in the less than 5 million passengers a year category for the third year in a row (worldwide), and best domestic airport for the second year in a row. In March 2007, the airport earned two first-place finishes in the 2006 Airports Council International (ACI) Service Quality Awards held in Dubai, United Arab Emirates. For the fourth consecutive year, it ranked first in overall passenger satisfaction for airports worldwide with under five million passengers. In addition, the airport ranked first in the Americas in the new category of Airport People Awards, and second in the best domestic airport worldwide category. In early 2010, Halifax Stanfield was rated by passengers as the Best Airport in the World in its class (under 5 million) for the seventh year in a row. In 2011 it won third Best Airport in North America of the Airport Service Quality Awards by Airports Council International, as well as 3rd Best Airport by Size in the 2 to 5 million passenger category. The Air Terminal Building (ATB) was opened in August 1960. It cost about C$4.5 million to construct and, upon opening, included health, immigration and customs facilities for international passengers; a restaurant; a control tower and administrative offices; and two observation decks that projected onto the apron. It was designed by Gilleland and Strutt of Ottawa, in collaboration with C.D. Davidson of Halifax as well as A.W. Ramsey, chief architect at the Department of Transport. The main contractor was Ellis-Don. The modern complex contained Nova Scotia's first set of escalators. Today, the terminal serves over four million passengers per year. The growth experienced in the decades since the airport's construction has necessitated constant renovations, and there is often construction occurring there. Since the HIAA took over management of the airport in 2000, over $200 million has been invested in improvements to the terminal building. A new international arrivals area, three times larger than the previous one, opened at the north end of the terminal in August 2001. The upper level of this expansion included a space reserved for United States border preclearance facilities (see below). A new domestic arrivals hall, accommodating three baggage reclaim belts and a Nova Scotia visitor's centre, officially opened on December 18, 2002. Work also began in 2002 on a significant renovation to the central lobby of the terminal building. This expanded retail and dining space opened as the Airport Square on November 9, 2003. A third-storey public observation deck opened at the same time. A southern terminal expansion was completed in 2005, expanding the departures holdroom, adding three new jet bridges, and creating a dedicated commuter aircraft facility with new ground-loading gates. In December 2004, U.S. Customs and Border Protection approved Halifax for U.S. border preclearance. It took effect in late 2006. HIAA used to be the busiest airport in Canada without U.S. customs preclearance. On September 12, 2007 the airport authority announced the construction of a 2,300 space, five-storey parking garage, which was completed on March 12, 2009. The terminal now has a total of 32 gate positions, with 13 using airbridges (gates 12, 14–16, 18, 20, 22–24, and 26–28). The remaining gates are ground-loading positions. Gates 22–24 and 26–28 are swing gates: a glassed-in secure corridor allows incoming international passengers and pre-cleared departing US passengers to be segregated from those in the domestic/international departure lounge; when used for US departures, these gates are numbered 52–54 and 56–58, respectively. Gates 2 (a-e) to 9 are ground-loading positions dedicated to domestic regional operations. Gates 34 to 46 are ground-loading gate positions for US flights. Halifax Stanfield has had two runways, arranged perpendicular to each other, since opening in 1960. In press releases the airport authority refers to the longer one as the "main runway" and the shorter as the "secondary runway". All taxiways are 75 feet (23 m) wide except for the 50-foot-wide taxiway K.
Taxiways B and D (now M and D; see below) were constructed in 1982, providing a taxi route paralleling runway 14/32. In 2010, extension of the taxiway system resulted in an increased airside area, creating space for several newly constructed large hangars. Canadian Helicopters, Cougar Helicopters, Gateway Facilities, and IMP Group operate these new hangars along taxiways J and K.
In November 2012, an extension of both ends of runway 05/23 was completed to accommodate larger, wide-body aircraft. This increased its length from 8,800 ft (2,682 m) to 10,500 ft (3,200 m). This increase resulted in the renaming of several taxiways: taxiway B became M, and the end of taxiway A was renamed B. In 2016 a new apron was constructed off taxiway J to serve primarily as a place to park cargo freighters. The airport covers a total of 2,372 acres (960 ha) of land. Construction of a hotel adjacent to the airport terminal was planned for some time. Halifax businessman Don Keddy began work on a $25-million hotel in 1990, but the project stalled due to financial problems. Transport Canada demolished the unfinished hotel in 1996. The airport authority announced on May 13, 2008 that a letter of intent had been signed with New Castle Hotels and Southwest Properties for construction of a 176-room Sheraton hotel. It was estimated to cost about $30 million and would have included a fitness centre, swimming pool, conference centre, and dining facilities. In early 2009 the airport authority and the developers jointly agreed to postpone construction of the hotel due to the global economic downturn. In early 2010 the developers pulled out of the deal. On October 26, 2011 the airport authority announced the construction of an on-site 14-storey, 169-room, Alt Hotel. Linked to both the passenger terminal and the parking garage by an enclosed footbridge, the $27 million building was built by Marco Construction of Halifax and opened in 2013. Operated by Groupe Germain Hospitalité, the hotel includes conference and banquet facilities, a fitness centre, a pool, and a 24-hour cafe. It was built with soundproof windows to block aircraft noise. The airport is served by several fixed-base operators (FBOs), which handle fueling, ground handling, hangarage, catering, etc. They include Air Canada Technical Services, Aircraft Service International, Gateway Facilities, Halifax International Fuel Facility Consortium (HIFFC), Inland Technologies, Innotech-Execaire, PAL Aviation Services, Shell AeroCentre, Strategic Aviation, and Swissport. Halifax Regional Police provides policing services. Emergency rescue and firefighting services are based in the Combined Services Complex (CSC), which also houses the airport's maintenance operations. The C$24-million, 6,000-square-metre (65,000 sq ft) building opened in 2010, replacing the previous fire hall (built 1981) as well as the former maintenance garage, which opened with the airport in 1960. The complex includes a fire station, vehicular wash and storage bays, offices, conference rooms, staff rooms, sleeping quarters, and an emergency communications centre. The CSC was the first LEED certified building at the airport. Halifax International Airport was one of a handful of sites in eastern North America designated an emergency landing site for the Space Shuttle if a launch was aborted following liftoff. The airport kept in contact with Transport Canada and the National Aeronautics and Space Administration during each shuttle launch. The airport is located adjacent to the Aerotech Business Park, a municipally-run business park originally catering towards aviation companies. The zoning has since been changed to allow for other types of companies to locate there. The largest tenants are Pratt & Whitney Canada and L3 Communications. Several construction projects are underway at the airport in 2018 and 2019. The largest of these is the expansion of the terminal building through a three-storey extension onto the centre apron. The ground floor will house an expanded security screening area to increase capacity and allow for the implementation of "CATSA Plus", the Canadian Air Transport Security Authority's latest checkpoint design, which requires more space. The second floor will house an expanded, double-height passenger holdroom, with additional seating, as well as new dining and retail space. The airport authority is also increasing security at the terminal by installing anti-ramming bollards, blast-resistant glazing, more security cameras, and new access control features. Lastly, the domestic baggage claim area is being renovated for cosmetic reasons. Ceilings will be raised, column sizes will be reduced, and new flooring will be installed. The latest airport master plan was published in January 2011. Many of its proposals have since been realised, such as construction of an on-site hotel, the southern terminal expansion, and extensions of the main runway. Possible future plans outlined in this document include new taxiways and parking stands, another de-icing area, space for new logistics and aviation services development, and a major expansion of the public road network (partly built) to facilitate development of a large commercial area between the airport and the highway. On November 15, 2018, transport minister Marc Garneau announced Government of Canada funding, via the National Trade Corridors Fund, toward a $36-million expansion of the airport's air cargo handling facilities. The federal government will contribute $18 million, while $5 million will come from the province and $13 million from the airport authority. The expansion will be built on forested land adjacent to the existing cargo area. Construction is expected to begin in 2019. On the night of September 2, 1998, Swissair Flight 111, a scheduled flight from New York City to Geneva, declared a pan-pan after the crew noticed smoke in the cockpit. The flight crew attempted to divert to Halifax after dumping fuel, but crashed into the sea at the entrance of St. Margarets Bay, Nova Scotia, about 60 km from the airport. All 229 passengers and crew were killed. On October 14, 2004, MK Airlines Flight 1602, a Boeing 747-200F, crashed during takeoff from runway 23. All seven crew members died. On March 29, 2015, Air Canada Flight 624 crashed while attempting to land at the airport, shortly after midnight in stormy weather. All 137 passengers and crew survived. The crash cut power to the airport and damaged runway 05's antenna array. On November 7, 2018, Sky Lease Cargo Flight 4854, a Boeing 747-400F, overran runway 14 while landing and came to a rest near the Old Guysborough Road. All four crew members survived with minor injuries. MetroX route 320 is an express bus service that travels between the city centre and the airport, with intermediate stops at the Dartmouth Bridge Terminal and the suburb of Fall River. The route is operated by Halifax Transit (formerly Metro Transit) and runs all day on both weekdays and weekends. The airport is located at Exit 6 of Highway 102, which connects Halifax to the Trans-Canada Highway. It is a 28-minute drive from Halifax City Hall, the centre of Downtown Halifax. There are numerous car rental agencies located in the lower level of the airport car park. Aside from the parking garage connected to the terminal, the airport also offers Park 'N Fly Airport Parking, a long-term parking service owned by Hong Kong company CK Hutchison Holdings. ^ a b "Airport Statistics". Halifax Stanfield International Airport. Halifax International Airport Authority. Retrieved 26 April 2017. ^ a b "Halifax Stanfield Growth Reaches New Heights, 4.3 Million Passengers Served in 2018". Halifax Stanfield International Airport. Halifax International Airport Authority. 29 January 2019. Retrieved 29 January 2019. ^ a b c d e "History of Halifax (Stanfield) International Airport" (PDF). Halifax International Airports Authority. December 2015. ^ a b Dennis, Eric (12 October 1954). "Site approved for modern $5,000,000 airport for Halifax". Halifax Chronicle-Herald. ^ a b c Burrows 1987, p. 42. ^ a b "$18,000,000 Airport at Halifax To Be Formally Opened Today". The New York Times. 10 September 1960. p. 42. ^ Ziobrowski, Peter (3 September 2013). "Modernity and Air Travel – Halifax International Air Terminal Building". BuiltHalifax. ^ "New Canadian Airport". The New York Times. 2 August 1960. p. 59. ^ "Halifax Opens New Airport". The New York Times. 11 September 1960. p. 42. ^ Burrows 1987, p. 43. ^ "NAV CANADA and the 9/11 Crisis". NAV CANADA. 2009. Archived from the original on April 18, 2012. Retrieved 2009-03-19. ^ a b "September 11, 2001". Halifax Stanfield International Airport. Halifax International Airport Authority. Retrieved 3 October 2018. ^ Connell, Gina (2002). "Communicating in a crisis". Communication World. San Francisco. 19 (6): 18–21. ^ "HRM Trying to Accommodate as Many as 10,000 International Travelers". News Releases. Halifax Regional Municipality. 11 September 2001. ^ "PUBLIC SERVICE ANNOUNCEMENT". News Releases. Halifax Regional Municipality. 11 September 2001. ^ "Mayor Kelly Says HRM Returning to Normal". News Releases. Halifax Regional Municipality. 17 September 2011. ^ Rice, Condoleezza (11 September 2006). "Remarks to Halifax International Airport Officials and Staff". United States Department of State. ^ "Halifax to rename airport after Robert Stanfield: report". Canadian Broadcasting Corporation. 19 January 2005. ^ Lewandowski, John (10 September 2005). "Halifax terminal to bear Stanfield name". The Globe and Mail. ^ "Canada's New Government Renames Halifax International Airport in Honour of Robert L. Stanfield". Halifax International Airport Authority. 9 February 2007. ^ Phillips, Don (8 March 2006). "Travelers call Incheon best airport". International Herald Tribune. p. 15. ^ "World's top customer service airports for 2006". Archived from the original on 2012-02-06. Retrieved 2018-11-10. ^ Strutt, J.W. (December 1960). "Three International Air Terminals". Royal Architectural Institute of Canada Journal. 37 (12): 509–526. ^ "After 50 Years of Service Nova Scotia's First Escalators Retire". News Releases. Halifax International Airport Authority. 21 July 2008. ^ a b c d "Halifax Stanfield International Airport 2017 Economic Impact Report" (PDF). Halifax International Airport Authority. August 2018. ^ "Annual Report 2001" (PDF). Halifax International Airport Authority. 2002. ^ "Annual Report 2002" (PDF). Halifax International Airport Authority. 2003. ^ "Annual Report 2003" (PDF). Halifax International Airport Authority. 2004. ^ "Annual Report 2005" (PDF). Halifax International Airport Authority. 2006. ^ a b "Airport Specs". Halifax Stanfield International Airport. Halifax International Airport Authority. Retrieved 1 September 2018. ^ Burrows 1987, p. 60. ^ a b c "Halifax Stanfield International Airport 2016 Economic Impact Report" (PDF). Halifax International Airport Authority. 31 October 2017. ^ a b Peters, Tom (14 May 2008). "New Sheraton hotel to open at Halifax Stanfield airport". Halifax Chronicle-Herald. ^ "Construction of Sheraton Hotel at Airport on Hold for up to Twelve Months". Halifax International Airport Authority. 5 February 2009. ^ a b Lambie, Chris (26 October 2011). "Flip-flops from room to terminal". Halifax Chronicle-Herald. ^ "Alt Hotel Halifax Airport". Le Germain Hotels. Retrieved 19 May 2017. ^ Zaccagna, Remo (22 November 2012). "Boutique hotel to open doors at airport in April". Halifax Chronicle-Herald. ^ "Fixed-base Operators". Halifax International Airport Authority. Retrieved 28 August 2018. ^ "Fuelling agents". Halifax International Airport Authority. Retrieved 28 August 2018. ^ "Ground handlers". Halifax International Airport Authority. Retrieved 28 August 2018. ^ Willick, Frances (4 December 2015). "Halifax police win airport contract, to take over security from RCMP". Halifax Chronicle-Herald. ^ Woodford, Zane (19 January 2016). "Details emerge about Halifax Regional Police contract for airport security". Metro Halifax. ^ "Airport Authority Announces Plans to Build Combined Services Complex New Structure to House Fire Hall and Maintenance Facility". Halifax International Airport Authority. 7 August 2008. ^ "Halifax International Airport Authority Combined Services Centre". Marco Group. Retrieved 28 August 2018. ^ "HSIA Combined Services Building" (PDF). Strescon Limited. Retrieved 28 August 2018. ^ "New Building at Halifax Stanfield Receives LEED® Certification Combined Services Complex Awarded Silver Status". Halifax International Airport Authority. 18 April 2013. ^ Lambie, Chris (5 July 2006). "Halifax possible shuttle pit stop". Halifax Chronicle-Herald. ^ "Construction on Air Terminal Building & Security Infrastructure Upgrades Underway at Halifax Stanfield". Halifax International Airport Authority. 14 March 2018. ^ a b "Construction at Halifax Stanfield". Halifax International Airport Authority. Retrieved 31 August 2018. ^ Davie, Emma (24 June 2018). "Halifax airport beefs up security by installing concrete posts, adding cameras". Canadian Broadcasting Corporation. ^ Groff, Meghan (29 August 2018). "Air passengers asked to plan ahead and arrive early". Halifax Today. ^ Jacobs Consultancy (January 2011). "Master Plan: Halifax Stanfield International Airport" (PDF). Halifax International Airport Authority. ^ Withers, Paul (15 November 2018). "Booming seafood exports leads to $36M cargo expansion at Halifax airport". CBC News. ^ "Air Canada Makes Strategic Enhancements on Eastern Canadian Regional Routes for Spring 2019". Air Canada. February 14, 2019. Retrieved February 23, 2019. ^ Liu, Jim (9 January 2018). "Delta adjusts New York – Halifax flights from May 2018". Routes Online. ^ "Swoop releases its full summer schedule adding seven new markets", Swoop, 22 January 2019 Retrieved on 01 April 2019. ^ "Halifax Stanfield Continues to Grow". Halifax Airport. December 19, 2018. Retrieved December 20, 2018. ^ "WestJet to launch seasonal, non-stop service to Dublin from Halifax". WestJet. November 22, 2018. Retrieved November 22, 2018. ^ "WestJet heads to Paris and London from Halifax". WestJet. 29 January 2018. Retrieved 29 January 2018. ^ "Route Planner". Air Canada Cargo. Retrieved 6 September 2018. ^ "Overview". CAL Cargo Airlines. Retrieved 4 September 2018. ^ "Halifax Stanfield Attracts Additional Cargo Flights to China". Halifax International Airport Authority. 14 August 2018. ^ "Taking Flight: Annual Report 2000" (PDF). Halifax International Airport Authority. 2001. ^ "Halifax Stanfield Surpasses 4 Million Passenger Milestone – Growth Expected to Continue at Atlantic Canada's Gateway". Halifax International Airport Authority. 25 January 2018. ^ Aviation Investigation Report A98H0003: In-Flight Fire Leading to Collision with Water. Transportation Safety Board of Canada. 27 March 2003. ^ Aviation Investigation Report A04H0004: Reduced Power at Take-off and Collision with Terrain. Transportation Safety Board of Canada. 6 April 2006. ISBN 0-662-43546-X. ^ "Air Canada AC624 touched down 335 metres short of runway, TSB says". CBC News. 29 March 2015. ^ Aviation Investigation Report A15H0002: Collision with terrain. Transportation Safety Board of Canada. 18 May 2017. ISBN 978-0-660-08379-7. ^ "747 cargo jet goes off runway at Halifax airport". CBC. Retrieved 7 November 2018. ^ "Cargo plane goes off runway while landing in Halifax, sending 5 crew members to hospital". Toronto Star. 7 November 2018. ^ "Update #1: Halifax Stanfield Responds to an Aircraft off the End of Runway 14/32 upon Landing". News Releases. Halifax International Airport Authority. 7 November 2018. ^ "MetroX Service". Halifax Transit. Retrieved 4 May 2017. ^ "Car rentals". Halifax Stanfield International Airport. Retrieved 4 May 2017. Burrows, Kenneth C. (1987). The Aero Tech Park as a Model for Industrial Development from an Environmental Perspective (PDF). Halifax: Saint Mary's University. Past three hours METARs, SPECI and current TAFs for Halifax International Airport from Nav Canada as available. This page was last edited on 24 April 2019, at 00:24 (UTC).